Home / Blog / Fresh is best! Feed More’s Steve and Sara Bayard Community Kitchen is a 5,400-square-foot, state-of-the-art facility that boasts top-quality commercial equipment and a Silver Leadership in Energy and Environmental Design (LEED) certification awarded by the U.S. Green Building Council. Meals are planned about a month ahead of time, with the season and available fresh ingredients in mind. Our in-house nutritionist works with our kitchen staff along with the USDA and Virginia Department of Aging Nutritional Guidelines to create menus. We also rely on and incorporate client feedback into our more than 14 different diet types that are not only nutritious, but also full of great flavors. Each meal that comes out of our Community Kitchen is cooked from scratch and with a home-made, comfort food feel that our recipients enjoy and have grown to love. 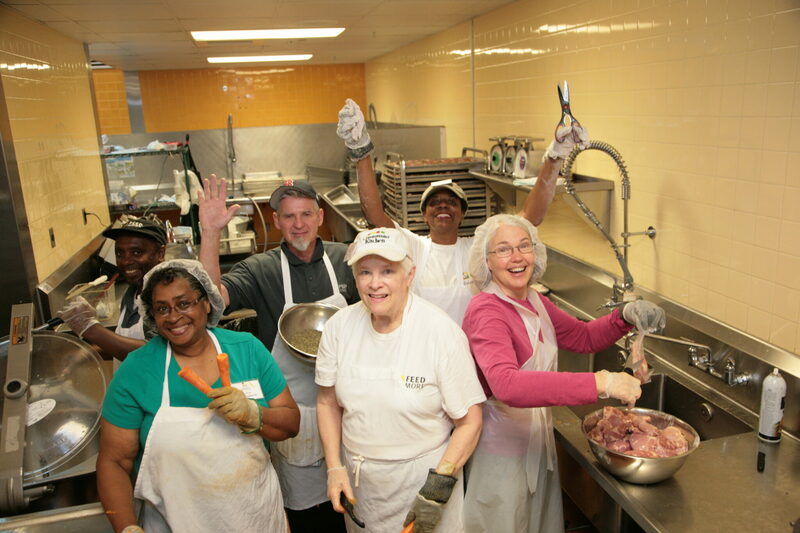 Volunteers who work in our Community Kitchen are usually either in the preparation or packaging area. Preparation is where all the vegetables are chopped and meat gets cut, while our packaging area is where it all comes together. Meals are put into individual containers for our Meals on Wheels recipients, sealed up and then flash frozen until delivery. The kitchen is a lively place to be, with some great music, and you can always hear the laughter from all corners. It’s no wonder it’s one of our most popular areas to volunteer! Are you interested in volunteering in the Community Kitchen? Get in touch with our Volunteer Department and fill out an application!